Hot news of another sale as Moran Yacht & Ship closes on the sale of Trinity’s 49.9m motor yacht Mine Games with Carmine Galati at Galati Yacht Sales acting for the buyer. Mine Games was built in 2007 to ABS class and is MCA compliant. A classic Patrick Knowles interior features raised panelling in American cherry wood, and a large open plan main saloon has a formal dining room for 10 guests. Accommodation is for 12 guests in five staterooms. The full beam master suite is split level on the main deck and has a king size bed and a 42 inch plasma television plus en suite facilities. The VIP stateroom also boasts a king size bed and has a vanity unit and en suite bathroom. Two doubles and a twin complete the accommodation and have en suite facilities and entertainment centres. 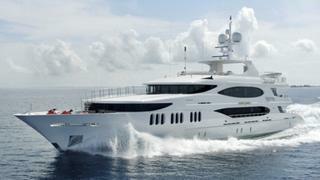 Twin 3,384hp Caterpillar engines give her a cruising speed of 20 knots and a range of 3,000 nautical miles at 12 knots. Mine Games is helicopter capable and is fitted with zero speed stabilisers. Mine Games was asking $19,950,000.